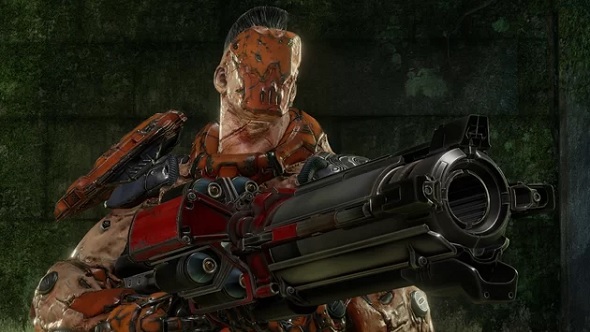 Free games: We have 5000 Steam keys for rocket-jumping shooter Quake Champions! Remember Quake: the blistering pace, the explosions burning the back of your ears, counting down until the rocket launcher respawns? It’s a classic series famous for its competitive shooter spirit – which its latest entry retains, and then some. But while Quake Champions has everything that made the series so dearly loved in the first place it also adds one or two modern features. The biggest of which is right there in the game’s title: champions. These are new gun-toting warriors with unique attributes and abilities. It means that you can find a character that best suits your playstyle and then hone your skills further with them. Obviously, another one of the new features is the game’s visuals. There are no low-poly concrete celllars here. Those grimy stone walls are detailed with ooze, chains, and bloodstains. Not that you’ll have time to admire them given that you’ll be charging around turning people into giblets with a railgun. Right? Now you know what Quake Champions is all about – and, if you don’t, please do check out the trailer below – let’s ask you a question: would you like to play it? Obviously the answer is yes. As such, you’ll be pleased to find out that we have 5000 Steam keys for Quake Champions up for grabs. Each key getsyou instant access to the free-to-play version of the game that will launch later this year. That also includes theRanger as the base Champion, plus all the maps and modes, while other characters and skins can be bought in-game if you so wish. All you have to do to get a key is enter the competition via the widget below.Every action you complete is worth one entry into the giveaway with the more actions you complete increasing your chanes of winning. We’ll also need your email address so we can send you a code upon winning – we won’t send you spam, we promise. Please read ourterms and conditionsbefore you enter.